A pair of powder and shot measures with ebony rammer handles. The shot measure is graduated from 1 oz. to 1 1/2 oz and the powder measure is 2 1/2 drams to 3 1/2 drams. Good condition. Two pinfire redecappers. Neither have any makers name but both are marked 12. Both in very good condition. A selection of wooden cartridge rammers obtained from the gunmaker S.R. Jeffery & Son of Guildford when they closed the shop. Good condition. A 12B spring loaded recapper. Good condition. A selection of adjustable powder and shot measures by James Dixon & Sons Sheffield. Good condition. Two adjustable powder measures by G & J. Hawksley Sheffield. Good condition. A 12B cage type redecapper tool. Good condition. Missing the decapping needle. A 12B roll turnover by James Dixon & Sons Sheffield. This model has a clip type claw to grip the rim of the cartridge. Marked with Dixon's catalogue number 3119. Good condition. Wear and corrosion to paint, but a scarce tool. A combination 12B loading tool with decapper, filling tube, rammer, recapper and a hand roll turnover marked Patent 5535 1884. Nickel plated with boxwood handles. This was a patent by J.C. Cocker in 1884. The decapping needle has broken and the thread on the screw attaching the lever is worn. Otherwise good condition. A 12 Bore spring loaded decapper. Good condition. A 12B Patent clip roll turnover by G & J.W. Hawksley for loading pinfire or center fire cartridges. Very good condition with some original finish. It would improve with a careful clean. A 12B roll turnover. Fair condition. Unusual in that the calibre "12" is stamped on the body of the roll turnover as well as the lever. A 16B French pinfire roll turnover of a type I haven't seen before. It also fits a 14B pinfire cartridge (which is the calibre of the cartridge in the photo). The only marking is a letter B. Good condition. The screw clamp is rather loose in the thread. A 12B roll turnover tool bY G & J.W. Hawksley Sheffield. Good condition. A very rare 12B James Dixon & Sons redecapper catalogue number 1186 with spring loaded pillar. Superb condition with lots of original finish. A very difficult to find tool especially in this condition. A superb and high quality combination tool for a .380 revolver which de-caps, re-caps, resizes the case, casts the bullet, seats the bullet and fixes in the case (using two stabbers). Complete with the original black leather handle covers. Made by William Bartram Sheffield and marked with their trademark "Nimrod". These tools are hard to find. Very good condition. A couple of wooden pots that were used in S.R. Jeffery gunmakers for gun powder when filling cartridges with a dipper. Good condition. A 12B Wm. Bartram combination roll turnover filler and rammer for pinfire cartridges. Good condition. A rare 12B cartridge filler and spring loaded wad rammer for pinfire or centre fire cartridges. Made by Bartram & Harwood in Sheffield to their Patent no. 3154. Very good untouched condition with traces of the original lacquer. A .410 roll turnover by G & J.W. Hawksley. Very good condition. Quite rare and nicely scaled down. It is shown next to a standard 12B turnover for comparison. A very rare redecapper which can be adapted to 12 Bore, 16 Bore and 20 Bore using the sleeves which slide over the decapping pillar and lock with a bayonet fitting at the bottom. Stamped ALPHA trademark with the three bore sizes on one side and Patent No. 14901 on the other side. Good condition. This is the first one I have seen. A .360 Berdan redecapper. Stamped on the lever with the calibre and trademark of a figure standing next to a tree or post. Unusual in this calibre. Very good condition. A 12B Hawksley hand redecapper for a cased gun. Excellent condition. A rare 12 bore Thorn 1883 Patent brass case crimper. Henry Alfred Alexander Thorn was trading as Charles Lancaster having previously acquired the gunmaker. The brass shell case is pushed into the tool against a die which crimps together the open end onto a card top wad to form the closure. Good condition. Some loss of paint but a hard to find tool. A rare James Dixon redecapper catalogue number 1186. The tool is spring loaded and when the side knob is moved to the left it allows the central pillar to de depressed and the decapping pin is revealed. Another hard to find tool. Good condition. A 28 bore hand redecapping tool for a cased gun. Complete with spare pin contained inside the body of the tool. Excellent condition with lots of the original lacquer. A rare fixer for the .577/450 Martini Henry cartridge. Good condition. A 12 bore hand redecapper marked with the Patent number (first one I have seen with the patent number stamped on the tool). Good condition. A 12B spring loaded redecapper by G & J.W. Hawksley. The pin cover is missing but otherwise good condition. A couple of Kynoch Patent brass case crimpers. From left to right: 20B crimper (missing the die) 12B crimper complete with die. Good condition. A matched pair of adjustable powder and shot measures with horn handles. Good condition. A 10B roll turnover tool by G & J.W. Hawksley with two position lever. Nice condition with lots of case colours on the lever. A 12B hand roll turnover by Ward for a cased shotgun pinfire or centre fire. Good condition. A 12B hand roll turnover for a cased gun pinfire or centre fire. No name but very good quality. Excellend condition with virtually all the original case colours and a lot of lacquer. A 12B W. Bartram hand redecapper. Very good condition with some of the original blue remaining. A high quality matched pair of nickel silver and horn powder and shot measures by G & J.W. Hawksley. The shot measure has a rammer handle. Good condition. There is a tiny chip or beetle bite in the very end of the rammer handle. A 12 Bore hand redecapper. Good condition. A 16B base for use with a decapping rammer. Good condition. A 16B spring loaded base recapper by G & J.W. Hawksley. Good condition. A French 16 bore boxwood pinfire hand roll turnover. Very good condition. Great colour. A rare 8 bore roll turnover tool with ejector and 4 pin roller. Good condition. A 12B nickel plated combination loader. Good condition. Some wear to the plating. A 12B roll turnover tool by James Dixon & Sons Sheffield catalogue number 1202. The claw only pushes against the side on the rim of the cartridge to stop it turning when turning the chuck. A scarce tool. Good condition. Wear and corrosion to the paint. A rare Jones Patent Accuratus powder dispenser with scales for Black Powder and EC Powder. This is the model with nozzles. Overall very good condition with some wear but would probably improve a lot with a careful clean. A rare and massive 4 gauge hand re-decapper. I am not sure of the maker but the end cap is marked with a flying bird trademark. Shown next to a similar tool in 12 gauge for comparison. Good condition. Strangely it is too large to use on the 4G paper case shown in the photo so I wonder if it is for slightly thinner brass cases. A very rare 8 gauge pinfire re-decapper. Very good condition with quite a bi6t of the original lacquer remaining. A 16 bore hand roll turnover with a bee trademark on the end plate. Very good condition. A 16B roll turnover. Good condition. A couple of good quality shot measures. One by James Dixon and the other by G & J.W. Hawksley. Good condition. Two large measures for use with big bore guns. A nickel and ebony powder measure adjustable from 6 drams to 7 1/2 drams SOLD and a brass shot measure with ebonised handle adjustable from 1 1/4 oz to 2 1/4 oz. SOLD Both are in very good condition. A very rare Nobel travellers sample case for Ballistite powder. Very good condition. One of the glass phials has been replaced at some time in the past. A 12 bore Horsley Patent redecapper by G & J. W. Hawksley Sheffield. These tools were normally manufactured by James Dixon & Sons and so one marked Hawksley is pretty rare. Very good condition. A good example of a 12 bore Jeffries Patent Lever Machine. Very good condition. A 12 bore pinfire combination loader by James Dixon & Sons Sheffield 5165 in their catalogue. Very good condition and a rare tool. A rare 16 bore pinfire combination loader by William Bartram Sheffield. Very good condition. A rare 10 bore cage type redecapper (you normally only encounter 12B and 16B examples so rare in this calibre). Very good condition. A 12B roll turnover by G & J.W. Hawksley for loading center fire cartridges. Very good condition with lots of original finish. A 12B brass loading tube. Good condition retaining lots of the original lacquer. A 12B ebony rammer. Good condition. A 12B double base redecapper by James Dixon & Sons Sheffield and marked with their catalogue number 1197. Good condition. A 12B cartridge trimmer with spring loaded blade by G & J.W. Hawksley. Very good condition. The screw holding the handle has sunk into the handle but everything is firm. A matched pair of powder and shot measures by Ward & Sons Birmingham (one measure is stamped Ward & Sons on the bottom). Good condition. A 12 Bore hand redecapper. Not maker marked but of the style manufactured by William Bartram. Good condition. A 12 Bore hand roll turnover tool by James Dixon & Sons. Very good condition. A 12 Bore recapping and rammer/filler tool by James Dixon & Sons. Good untouched condition. Could do with a gentle clean. A 12 Bore hand redecapper by P. Webley and stamped with their catalogue number. Good condition and quite a rare tool. A 12 Bore double barrelled redecapper described in the catalogues as "for camp use". Good condition. A very rare 12 Bore brass case crimper for a rifle cartridge probably Paradox or similar. Marked G & J.W. Hawksley. Very good condition. The only tool of this pattern I have ever had. A 16 Bore redecapper by James Dixon & Sons Sheffield. Excellent condition with lots of the original gilt lacquer remaining. A 12 Bore decapper with ebony handle. Good condition. A matched pair of powder and shot measures with black buffalo horn handles. Powder adjustable from 2 1/2 to 3 1/2 drams and the shot 1 to 1 1/2 ounces. Very good condition. A superb pair of best quality powder and shot measures by James Dixon & Sons. This pattern is very rare. One is missing the tiny screw for the adjustment and both are missing their locking screws. Otherwise very good condition and untouched. A 12B cartridge trimmer by G & J.W. Hawksley. Good condition. A 10 Bore redecapper for a cased gun. Made by James Dixon & Sons. Hard to find in this large size. Very good condition. A powder loading tool (missing the hopper which would have contained the powder) which works on a very simple but ingenious way of the measure sliding on guides between the inlet from the powder container and the cartridge case. It looks as though it is for loading rifle cartridges and is of Norwegian manufacture marked A. Bjerre Odense.. Good condition. A very rare 12B cartridge extractor combined with a powder and shot measure. Very good condition. A 12B camp redecapper by G & J. W. Hawksley. This is the only one I have seen with their name on it. Dirty but good condition. In need of a careful clean but quite a rare tool with Hawksley's name on it. A 12B combination roll turnover tool with funnel and rammer by James Dixon & Sons. The lever is marked with their catalogue number 1164N. Very good condition. A 16B roll turnover and rammer by James Dixon & Sons. Stamped with their catalogue number 5164NS. Very good condition. Minor crack to one brass ferrul on the top ebony knob and the screw holding the lever has been fitted with a non-original nut. Most of the orginal paint remains and strong case colours to the steel parts. Quite a rare tool. A high quality matched pair of powder and shot measures by G & J.W. Hawksley. Excellent condition. A rare 14mm hand redecapper. No name but a Birmingham made tool probably by Lightwood or Ward. Very good condition and rare in this calibre. A 12B hand redecapper by Webley and stamped with their catalogue number. Good condition. Has been painted red and would improve with careful stripping. A very high quality matched pair of powder and shot measures by G & J.W. Hawksley. Nickel silver measures with black horn handles. Excellent condition. A 12B hand roll turnover tool by James Purdey & Sons and intended to be cased with one of their shotguns. Very good condition. A 16B wooden pinfire redecapper with spring loaded cap placer. Good condition. I have seen these before but not in this type of wood so a little unusual. A 12B roll turnover marked Bussey & Co. London. Good condition. Untouched and could do with a clean. A 10B roll turnover tool. Good condition. A superb 12B combination loading tool by James Dixon & Sons catalogue no. 5164NC. Fantastic condition with virtually all the paint, case colours and lacquer. Very hard to find in this condition. A 12B early combination loader by Bartram & Co. The only marking is the Bartram trademark of a riding cap and whip with "Nimrod" stamped on the screw clamp. Good condition. Shows signs of use and some wear but a rare tool. A 12B combination roll turnover and redecapper with a loading funnel and spring loaded rammer. Good condition. The roller ebony knob has been chewed by rats. A rare 10B upright filler/rammer and roll turnover machine by Jeffries Norwich. generally good condition. Some rust as you can see in the photos so could do with a careful clean. Difficult to find in this larger calibre. A 12B spring loaded recapper by W. Bartram. Very good condition. A 12B brass case crimper by Kynoch made to their patent 609. Very good condition. A rare matched pair of big bore powder and shot measures with ebony handles. The powder measure is adjustable from 5 to 7 drams and the shot measure 2 to 2 1/2 ounces. Very good condition. A 20B cartridge trimmer. Excellent condition. A 12B combination loader made to J.C. Cocker Patent. Nickel plated with boxwood handle and rammer. Good condition. A 12B cage type redecapper. Very good condition. A .410 roll turnover stamped Demon which is the trademark of the Midland Gun Company. Good condition untouched and dirty. Would improve with a careful clean. A 12B combination roll turnover and redecapper with a funnel and spring loaded rammer. The lever is stamped Demon which is the trademark of the Midland Gun Company. Good condition. A 10B hand roll turnover tool by James Dixon & Sons. Rare pattern and unusual in 10 bore. Good condition. A rare large powder measure by James Dixon & Sons adjustable from 4 to 5 drams. Good condition. A 12B Erskine Patent bulk loading machine for 100 cartridges. Complete with two boards to adjust the measure, wadding board, front surplus tray and four footed rammer. Very good condition. A rare 16B Riviere & Bakers patent roll turnover tool by James Dixon & Sons. I think this is a late made tool as it has black painted wooden handles rather than ebony and black japanned levers and roller. Good condition. A 12B redecapper by G & J.W. Hawksley. The decapping needle is broken and needs replacing but I haven't been able to unscrew the decapping pillar which needs a good soak in some oil. Otherwise very good condition. A very rare 16B pinfire hand roll turnover by Bartram & Harwood with an adjustable depth stop. Very good condition with some of the original lacquer remaining. A 12B Kynoch Patent crimper for brass cartridge cases. The loaded case is pushed against the die which partially crimps the case mouth over the top wad. Good condition. A 16B Hawksley patent clip roll turnover tool made for loading pinfire and center fire cartridges. Excellent condition. Not so common in 16 bore. A rare nickel silver Dougall & bartram patent fixed powder measure (throwing 1 7/8 drams) for a cased "best quality" British black powder rifle. Very good condition. A 16B Hawksley Despatch redecapper. Very good condition. A superb 10B Hawksley filler, rammer and roll turnover machine in great condition. Lots of case colours and original paint and lacquer. Hard to find in thei calibre and condition. A rare .410 redecapper. Very good condition with most of the original paint. The pillar is slightly bent as you can see in the photos. A 20B redecapper. No makers marks. Very good condition. A .410 Lightwood roll turnover tool. Good condition. A very rare 8B roll turnover tool by James Dixon & Sons Sheffield and stamped with their catalogue number 1201. Good condition. A rare 12B Bartram & Co. pinfire roll turnover and filler/rammer machine. Good condition. Minor cracks to the wooden handles and pitting to the steel clamp and lever. A very rare 12B pinfire loading machine by Jeffries Norwich built to their patent of 1859. A very large machine which measures 16 1/2" high. Excellent condition and very hard to find one this good. A superb 12B roll turnover tool by James Dixon & Sons and made for the famous gunmaker E.M. Reilly & Co. Fantastic condition with virtually all the original paint. Another rare 12B Bartram & Co. pinfire roll turnover and filler/rammer machine. Good condition. Some of the original paint remains. A rare .360 bullet seater for an Alexander Henry rifle. Stamped with AH and the serial number of the rifle with which it would have originally been cased. I think the serial number corresponds to manufatcure in 1872 and it would have been for a double rifle or falling block. Excellent condition. A 28B roll turnover. Excellent condition. A rare nickel silver and ebony Dougall & Bartram Patent powder measure made by G & J.W. Hawksley of Sheffield. Very high quality and suitable for casing with a good quality British rifle. very good condition. A 12B roll turnover combined with a filler, rammer and redecapper stamped Demon which I think is the trademark of Midland Gun Company. Very good condition. A 12B roll turnover combined with a filler, rammer and side mounted redecapper. Very good condition. A rare 24B roll turnover by Hattersley Sheffield. Very good condition. A superb 16B nickel silver best quality roll turnover by G & J.W. Hawksley Sheffield. Excellent condition. A very rare variable calibre redecapper by James Dixon & Sons Sheffield. 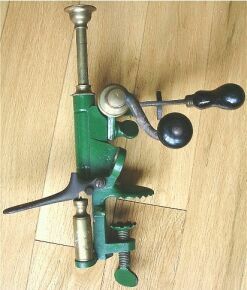 This tool resembles a Greenfield patent redecapper but is a version produced by Dixons which has circular rings that screw on to the decapping leg converting it to another calibre. The tool is complete with two of these rings and they are shown dismounted in one of the photos. It is an extremely rare tool. Good condition. A Dougall & Bartram spring loaded powder measure of the type found cased with black powder breech loading big game rifles such as Alex. Henry , Rigby, Holland & Holland etc. The measures is calibrated in grains and is adjustable 42, 46 and 50 grains powder. Dirty but good condition. A very unusual military tool for cutting cordite. I have never seen one before. Dated 1941. Very good condition. A 12B hand roll turnover to go with a cased shotgun. Good condition. A combined powder and shot measure with ebonised rammer handle. Good condition. A 10B hand redecapper.Good condition. A 12B capper and loading tube by James Dixon & Sons. Good condition. A very rare .380 calibre redecapper. This is the only one I have seen in this calibre.Good condition.Retains lots of paint. The pillar is slightly bent as you can see in the photos, but this shouldn't affect its operation. A rare 12B Bartram Patent redecapper with a spring loaded decapping pillar.Good condition. A rare 12B Thomas Johnson Patent roll turnover and redecapper. The decapping pillar screws into the roll turnover roller. The handle has a compartment for spare decapping pins. Very rare to see a complete example of these tools. Good condition. A very rare 12BGreener & Lightwood bench crimper for use with all brass cases.The mouth of the case is forced against a die which crimps the end onto a top wad. Dirty and untouched condition. A 16B ebony wad rammer. Very good condition. A matched pair of powder and shot measures. Suitable for a cased shotgun. Good condition. A 12B G & J.W. Hawksley roll turnover tool for pinfire or center fire cartridges. Very good condition. A rare Riviere & Bakers Patent 12B roll turnover by James Dixon & Sons Sheffield. Very good condition and the better quality model with the steel roller rather than brass. A large powder tin for E.C. No.2 Sporting Powder by the E.C. Powder Company London. Measures 7 5/8" high x 7 1/4" wide and 5" deep. Excellent condition. A rare variant of the Hawksley Despatch redecapper marked " Invented & manufactured by G & J.W. Hawksley " rather the normal stamping and with a brass swivel arm rather than the standard steel arm. I have not seen one like this before and I wonder if it is a very early version. Very good condition. A 12B James Purdey ebony cartridge rammer. Good condition. A 12B pinfire upright roll turnover and rammer filler combination tool by Bartram & Co. Sheffield. Good condition. Untouched and uncleaned with dirt and patina. Stamped Nimrod and Bartrams trademark of a jockey hat and whip on the vice screw. A selection of powder and shot mearsures. Very good condition. A good quality British boxwood and brass 12B capper and decapper with the brass base block. Very good condition. A 16B redecapper.Very good condition. A 12B Horsely Patent redecapper by James Dixon & Sons Sheffield. Good condition. A 12B roll turnover tool by Lightwood & Son Birmingham. Good condition. A rare adjustable powder and shot measure by James Dixon & Sons catalogue no. 1107A. When the ebony handle is unscrewed slightly this allows the measure to slide up and down in the outer casing and is locked at the desired charge by screwing in the handle. This pattern of measure is very hard to find. A rare Dougall & Bartram pattern powder measure intended to be cased with a high quality rifle. Fixed charge of 4 3/4 drams with a spring loaded side lever. Very good condition. A 12B pinfire redecapper made by James Dixon & Sons Sheffield. Excellent condition. A very good James Dixon & Sons Barclay pattern 12B filler and rammer with it's original boxwood loading block base. Very good condition with most of the original lacquer. A rare 12B pinfire hand roll turnover by James Dixon & Sons Sheffield marked with their catalogue no. 1117 . Very good condition. Two cartridge rammers for rifle cartridges. The top rammer is of ebonised wood and would be suitable for .450 and the lower rammer is ebony and for .500 caliber. Very good condition. A 12B roll turnover tool stamped T. Bland & Sons London. Good condition. Possibly repainted, but rare with this retailers name. A 12B pinfire or centre fire roll turnover tool by G & J.W. Hawksley of Sheffield. Made under their Patent of 1865. Horn handles. Good condition. Some loss of paint and a very small chip to one horn handle. A 16B roll turnover tool with ejector. Good condition. A 12B roll turnover, rammer and filling machine made by Bartram & Co. Sheffield. Good condition. A 12B roll turnover tool by James Dixon & Sons. Generally good condition. Minor crack to ebony handle. A 12B roll turnover tool by Lightwood & Son Birmingham and stamped with their partridge trademark. Very good condition. A 12B combination reloader with loading funnel, spring loaded rammer, redecapper and roll turnover made by Ward & Sons Birmingham England. It has lost nearly all the paint but could be repainted or polished to improve the looks. Otherwise good working condition. A matched pair of powder and shot measures by James Dixon & Sons. Very good condition with most of their original lacquer. An unusual James Dixon & Sons metallic cartridge creaser which appears to be a factory adaptation of their cartridge trimmer which is catalogue no. 1114. The barrel is convex at the end to allow the nose of the bullet to seat when the spring loaded creaser is released to impress the brass case as it is rotated. Although the stamped number corresponds to a cartridge trimmer the positioning of the lever can only be for a cartridge creaser. Very good condition. A selection of powder and shot measures.Very good condition. A 12B Patent clip pinfire or centre fire roll turnover tool by G & J.W. Hawksley and made to their patent of 1865. Very good condition. A 10B roll turnover. Good condition. At the top is a 20B cartridge sizer by G & J.W. Hawksley and below is a 12B sizer marked WJS with B underneath. price. Both very good condition with lots of the original case colours remaining. A French cartridge trimmer stamped EL - could this be Eugene Lefaucheux ? Good condition. A 12B cage type redecapper.Very good condition. A very rare hand held roll turnover marked TJ for Thomas Johnson and registered design in 1868. The steel spring on the side is pressed and has prongs which grip the side the head of the cartridge whilst the ebony handle is rotated.Very good condition. The ebony handle has some chipping on one side. A 16B redecapper.Good condition. Could do with a careful clean. A 28B hand redecapper. Very good condition. A 12B combined roll turnover and redecapper. Unamed but probably made by Lightwood or Webley of Birmingham. Good condition. A rare 12B roll turnover tool with swing out redecapper which has a spring loaded arm. This was made to the P. Webley registered design 6123 of 1879. No makers name marked on the tool. This a very hard to find combination loader. Very good condition. Slight ding to the funnel and some loss of paint. A 12B Cocker Patent combination loader. Missing the boxwood rammer. Good condition. A very rare Rigby & Bartram patent redecapper for rifle cartridges. The calibre is not marked on the tool but from my measurements it appears to be for a .500/450 cartridge. Good condition. The decapping needle is broken. A rare 12B Thorn 1883 Patent brass case closer for crimping full brass cartridges. The Patentee Henry Alfred Thorn owned and traded as Charles Lancaster 151, New Bond st. London. Complete with the die. The loaded brass case would have a top wad and then be forced into the die inside the tool to form a crimp onto the thin top wad. Very good condition and a hard to find tool. A 10B redecapper. Good condition. A superb example of a 12B boxwood Barclays Patent rammer and loading tube. Excellent condition. A selection of spares for the wooden Erskine cartridge loading machine including four footed rammers, edge trays and scrapers. Very good condition. A 12B Erskine Patent mahogany loading machine. I have several incomplete machines in various conditions suitable for spares. Please email me if you are interested. A 12B combination rammer filler and roll turnover. No Name but British manufacture. Very good condition. A 12B combination roll turnover rammer filler and redecapper tool by Ward & Sons Birmingham. Very good condition. A 12B roll turnover rammer filler and redecapper tool by Lightwood & Son Birmingham. Good condition. A rare 12B pinfire or centre fIre hand roll turnover tool by Lightwood & Son Birmingham.Very good condition. A 10B James Dixon & Sons hand redacapper.Very good condition and hard to find in this calibre. A rare cartridge crimper for a .380 cartridge. When the bullet has been inserted into the loaded cartridge it is put into the crimper and squeezed to crimp the case onto the bullet. The block has a raised ridge near the top of the case which will indent the case when the handles are closed. There is a hole in each block to allow and ejector (now missing) to poke out any sticking cartridge. Very good condition. This is the first tool like this I have had. A 12B Despatch redecapper by G & J.W. Hawksley of Sheffield. Very good condition with lost of the original lacquer and blueing remaining. A 20B roll turnover and redecapper. They appear to be marked with the partridge trademark of Lightwood & Son. Very good condition. Difficult to find a pair of tools in this caliber. A 16B redecapper of the type described as "for camp use". No maker marks. Good condition. A 12B Greenfield Patent redecapper (although not maker marked). Good condition. Some wear to the plating. A 12B combination roll turnover tool filler and rammer. Unamed but probably one of the Birmingham makers such as Webley, Ward or Lightwood. Good condition. A 12B Cocker Patent combination loader incorporating a decapper, loading tube, recapper, rammer and roll turnover. Good condition. Some pitting to the steel parts. A 16B hand redecapper by William Bartram & Co. Sheffield. Good condition. Some pitting to the steel parts. A 16B pinfire roll turnover by James Dixon & Sons. Very good condition. A 16B G & J.W. Hawksley patent clip roll turnover and filling machine. Good condition. Some pitting to the steel parts and chip to on of the horn handles. A 16B roll turnover tool by G & J.W. Hawksley. Excellent condition. lots of case colours to the steel lever. An ebony 12B rammer marked J. Purdey & Sons. Good condition. A 16B cartridge trimmer by James Dixon & Sons. Excellent condition. Lots of case colours remain on the steel parts. A 12B hand roll turnover for pinfire cartridges by G & J.W. Hawksley Sheffield. Good condition. The end plate is rusty and stained but would clean up much better. A rare 10B James Dixon boxwood loader. It is rare to find one of these in 10 gauge and even rarer to have a maker marked example (they are normally just marked with the registered design numer). Very good condition. There is a small age crack 1" long on one side of the body. A 12B James Dixon & Sons pinfire hand roll turnover tool. Fair condition. The steel closing plate has been painted black. Two 12B brass loading tubes and ebony rammers. One is made by Webley and is marked with their catalogue number. Good condition. A very rare 12B Riviere & Baker Patent roll turnover by James Dixon & Sons. Very good condition. A 10B Hawksley Patent clip roll turnover tool. Hard to find in this big bore. Very good condition. A .410 Lightwood & Sons (stamped with their partridge trademark) roll turnover tool. Very good condition. A rare 12B roll turnover tool with solid nickel body and of a very similar style to a Hawksley Patent clip but the rotating lever is slightly different and this could well be a prototype. No markings. Good condition but dirty and would improve with a clean. A 12B roll turnover by James Dixon & Sons Sheffield stamped with their catalogue number 5119. This is their first quality with case hardened levers and steel roller. Very good condition. A 12B combined roll turnover and redecapper stamped Demon. Very good condition. A shot bag for Walkers Parker & Co. Patent shot. Fair condition with some rust stains. A rare powder tin with coloured label by Pigou Wilks & Laurence. Fair condition with some rust. A Curtis & Harvey powder tin for Diamond grade gunpowder. Good condition. A small powder measure marked 1 3/4 drams. Good condition. A shot measure with ebony rammer handle by James Dixon & Sons Sheffield and stamped with their catalogue number 1104. Very good condition. A nickel silver shot measure with ebony handle. Very good condition. A shot measure by James Dixon & Sons with side locking screw. Measures 1 oz and 1 1/16 oz of No.6 shot. Excellent condition. A nickel silver shot measure by James Dixon & Sons Shefield. Good condition. Two nickel and ebony measures - one for powder and the other for shot. Good condition. Both need a good clean. A 10B combined roll turnover and rammer filler by Jeffries of Norwich. Excellent condition. A 12B pinfire combination roll turnover tool filler and rammer by Bartram & Co. Sheffield and marked with their trademark of a jockey hat and crop with NIMROD. Good untouched condition. Some cracks to the ebony handles. Still retains a lot of the original paint and some lacquer. An unusual small powder measure marked 1 3/4 drams. Very good condition. A rare large powder measure adjustable up to 5 drams. For use with a large bore shotgun or rifle. Very good condition. A 12B base redecapper incorporating a springloaded recapper. Very good condition. Unamed but probably by Lightwood & Son Birmingham. A 12B cartridge trimmer by James Dixon & Sons Sheffield. Good condition. A 12B combination loader incorporating a filler tube, spring loaded rammer, roll turnover and side mounted redecapper. Good condition. The cartridge ejector rod is missing the brass knob which screws on the end. A rare 5lb tin for Amberite gun powder. Good condition. An unusual wooden cartridge box for 100 12G cartridges sold by Thomas J. Watkins gunmaker in Banbury. Not often you encounter wooden cartridge boxes like this. Good condition - some slight loss of wood from the edge of the lid. A very high quality 12B roll turnover tool with highly polished lacquered body and case colour hardened levers and clamp. Superb condition. It is rare to find bench mounted tools finished like this - highly polished brass lacquered rather than a painted finish. No name marked on the tools but I think this is a Lightwood & Son made tool. A 20B roll turnover by Lightwood & Sons Birmingham. Very good condition. A 12B combined roll turnover and redecapper tool. No name but probably Lightwood & Sons Birmingham. Fair condition - will improve with cleaning. A 12B roll turnover tool by James Dixon & Sons Sheffield and marked JD&S with their tardemark of a bugle together with the catalogue no.1204C. Good condition. An empty shot bag for Walkers Parker & Co. patent shot of Newcastle . Very good condition. A 12B roll turnover tool by Ward & Sons Birmingham and also stamped with their trademark of a target. Good condition but needs a careful clean. A 16B nickel cartridge trimmer by James Dixon & Sons Sheffield catalogue no. 1111B. Good condition. Internal spring at fault and there is an old crack to the handle which you can see in the photos. A rare 12B Horsleys Patent roll turnover tool by James Dixon & Sons catalogue no. 1192. Excellent condition. A selection of original decapping pins for redecapping tools. Useful spares for the serious reloading tool collector. Good condition. A 12B roll turnover tool by Bartram & Co. Sheffield. Superb and rare in this condition. A 12B cartridge trimmer by James Dixon & Sons Sheffield. Very good condition. A .410 roll turnover tool by Lightwood & Son Birmingham and marked with their trademark of a partrifge on the lever. Very good condition. A Curtis & Harvey gunpowder tin for Extra coarse grain no.4 powder. Measures 4 1/4" high Good condition. A John Hall & Sons 5lb gunpowder tin for Special TS gunpowder. Measures 9 3/4" high Good condition. A Curtis & Harvey 5lb gunpowder tin for Field B no.2 powder. Measures 9" high Good condition. A Curtis & Harvey 5lb gunpowder tin for Special TS gunpowder. Measures 9" high Good condition. A 12B pinfire redecapper by W. Bartram. Very good condition. A rare spring loaded powder measure for loading rifle cartridges. Made under Dougall & Bartram Patent by William Bartram Sheffield. Adjustable from 42 grains to 50 grains. Very good condition. Suitable for casing with a top quality British rifle. A 12B boxwood hand roll turnover tool for pinfire cartridges. Lovely colour and excellent condition. This is a pretty early tool and was made for quite a short pinfire cartridge case. A 12B roll turnover tool by Lightwood & Son Birmingham. Good condition. Would improve with a good clean. A fixed charge powder measure for a cased rifle marked with the charge of 60 grains. Good condition. Retains quite a bit of the original lacquer. There is some solder around the joint on the measure but I do not think it has been resolded as the lacquer finish is not damaged. A 16B nickel cartridge trimmer by G & J.W. Hawksley Sheffield. Very good condition. A 12B hand screw type redecapper by Bartram & Co. Good condition. A rare 12B redecapper by James Dixon & Sons Sheffield. Good condition. A rare tool. A .577 redecapper. The lever is rusty and the makers name and calibre are illegible but almost certainly made by Bartram & Co. and a .577 cartridge fits. Good condition and hard to find in this calibre. A rare 12B redecapper by Greenfield London. Good condition. A 12B ebony rammer and roll turnover both marked J. Purdey & Sons. Excellent condition. A 12B hand redecapper probably for a cased shotgun. Superb condition with lots of the original case colours on the lever. A 12B combination roll turnover, filler and rammer tool by G & J.W. Hawksley Sheffield based on their 1865 patent for pinfire or centre fire cartridges. Generally good condition. A 12B hand redecapper intended for a cased gun. No makers name, just stamped 12. Excellent condition retaining lots of the original lacquered finish. A 12B cage type redecapper. Good condition. Missing the ebony handle and the decapping pin. A 12B redecapper by James Dixon & Sons Sheffield. Good condition. A 12B multi function tool patented by Joseph Charles Cocker in 1884. The tool allows you to decap, recap fill and ram and perform a roll turnover. It is complete with the circular cartridge holder used to grip the head of the case when performing a roll turnover. This part is usually missing. Very good condition with original colour and lacquer. A 12B roll turnover tool. Good condition. A 12B roll turnover tool by James Dixon & Sons Sheffield. Good condition. A 12B roll turnover tool by G & J.W. Hawksley Sheffield. Very good condition. A rare 12B brass case crimper by Henry Alfred Thorn trading as Charles Lancaster and patented by him in 1883. This tool had a die in the end of the barrel and the brass cartridge was pushed against the die using the strong lever which forced the end of the case to partially crimp on to the top wad. A very hard to find tool. Good condition. A rare 12B pinfire combination loading tool by Bartram Sheffield and marked with their trademark of a jockeys cap and riding whip with NIMROD. Good condition. Probably could improve a little with a careful clean. A colourful original Eley Kynoch advertising trade card. Measures 15 1/2 " x 12". Some damage which you can see in the photo but generally good condition. A good quality but unamed ebony and brass spring loaded 12B redecapper. To decap the brass end unscrews and the decapping pin is spring loaded and operates when you push the knob as you can see in the photos. Excellent condition. A 16B redecapper. Good condition. A very rare vintage lid from a cartridge box which originally would have contained 100 loaded cartridges. Alex Martin and Alex Henry (both Scottish Gunmakers ). Good condition. A few minor tears but well worth finding a plain bottom to complete the set. A 12B roll turnover tool by James Dixon & Sons Sheffield marked with their catalogue number 1202N. Very good condition. A 12B Horsely Patent redecapper tool made by James Dixon & Sons marked with their catalogue number 2181. This is the second quality model with the japanned lever rather than blued and painted maroon. Good condition. A 12B redecapper by Webley marked with their catalogue number 7032. Good condition. A12B roll turnover tool by James Dixon & Sons and marked with their catalogue number 1202. This tool has a cartridge ejector. Very good condition. A 12B Excell roll turnover tool by Lightwood & Son Birmingham. No paint and a little dirty and rusty but otherwise good condition and would benefit from a careful clean. An extremely rare Excelsior 12B combination loading tool by Webley of Birmingham and marked with their catalogue number 7045 and XLCR. The tool decaps, recaps, has a rammer and filling tube and performs the roll turnover. Some wear to the nickel plating but otherwise good condition and very very hard to find in any condition. This is the only example of this tool I have ever owned. A 12B cage type redecapper. Good condition. Another hard to find reloading tool - an adjustable James Dixon & Sons powder and shot measure catalogue no. 1107A. The ebony handle turns and allows the measure to slide up and down on a steel rod. The handle is screwed in to lock the measure. Excelent condition with lots of lacquer. A rare gun powder tin for Pigou Wilks & Laurence marked Challenge Sporting Gunpowder No. 2 grain. Good condition. A 12B Jeffries Norwich roll turnover. Good condition. A 12B James Dixon & Sons combination tool embodying a rammer, filling tube decapper and recapper. Marked with their catalogue no. 5448. Good condition. A 12B roll turnover tool by Lightwood & Son of Birmingham and marked with their trademark of a partridge with L&S underneath. Good condition. A rare pattern of a 12B Jeffries of Norwich combination loading tool with spring loaded rammer and roll turnover. Good condition. A .450 bullet fixer and cartridge resizer tool by G & J.W. Hawksley of Sheffield. Very good condition with lots of the original lacquer remaining. Two rare Dougall & Bartram patent measures. The top one is for powder and is graduated from 42 to 50 grains and the bottom one is for shot graduated from 1 to 1 1/2 ounces. This is the first D&B shot measure I have had - they are normally powder measures. Generally good condition. Some pitting on the levers and the wooden handles have been professionally replaced. A 12B unamed redecapper tool with blued lever. Good condition. Uncleaned. A 12B Horsely Patent redecapper tool made by James Dixon & Sons marked with their catalogue number 1181. This is the first quality model with the blued lever and painted green. Good condition. A best quality powder measure by G & J.W. Hawksley Sheffield with blond horn handle and nickel silver measure. Good condition. Minor chip to handle. A 16B combination roll turnover rammer filler and redecapper tool by Lightwood marked with their Partridge trademark on the redecapper lever. Good condition. Probably originally painted but now no paint remains. Uncleaned. A 12B cartridge trimmer by James Dixon & Sons of Sheffield and marked with their catalogue number 1111. Very good condition. A very large16B roll turnover tool by James Dixon & Sons described in their catalogue as for "Shop Use" and much bigger than the normal size tool. The second photo shows this tool next to a standard size tool to give some idea of scale. Some pitting and corrosion to the lever otherwise not bad condition. These big Shop tools are much rarer than the standard size and were intended to be much stronger for use in workshops and gun shops. A16B combination loading tool retailed by the famous gunmaker William Rochester Pape of Newcastle and so marked on the lever. Ebony handled spring loaded rammer and red body. Excellent condition. The roll turnover handle is slightly bent. A 12B roll turnover tool by James Dixon & Sons. Very good condition with some case colours and most of the original paint. A12B pinfire roll turnover tool by G & J. W. Hawksley of Sheffield with a very unusual type of clip lever which could be a prototype or transitional pattern as it differs from the normal pattern found making this tool rather rare. Some wear and pitting to steel parts but otherwise good condition. A rare small size measure for 5/8 ounce of shot. Very good condition. A 12B redecapper for a cased gun. No name but of very good quality. Very good condition. Lots of the original lacquer remains. A 28B redecapper. Good condition. It has lost it's painted finish but is rare in this calibre. A 12B pinfire roll turnover tool by James Dixon & Sons Sheffield catalogue no. 1119N. Good condition. A nickel silver shot measure by James Dixon & Sons Sheffield with a side locking screw. Adjustable for 7/8 oz and 1 oz. Good condition. Three cartridge wad rammers for (going from the top to bottom) 12B 28B and .450. Good condition. Excellent condition and all the tools are Purdey marked. A selection of vintage 12B shotgun cartridge case sizers. Good condition. A 12B roll turnover tool by Jeffries Norwich. Unusual in that the body of the tool is made of steel but the roll turnover chuck, roller lever and clamp are all made in brass. Good condition. A rare .450 bullet seater of the pattern that was used with Alexander Henry rifles and also by other "best" British makers. A great original case accessory. No markings so suitable for any make of .450 black powder rifle. Excellent condition. A 12B G & J.W. Hawksley pinfire redecapper. Good condition. The spring is rusty but everything is working. A matched pair of powder and shot measures with brass measures and ebony handles. Powder 2 1/2 to 3 1/2 drams and shot 1 to 1 1/2 ozs. Very good condition. Dirty and uncleaned with some lacquer still remaining. Two high quality measures with nickel silver measures and ebony handles by James Dixon & Sons Sheffield. Very good condition. A very rare 12B hand roll turnover tool for pinfire cartridges patented by Thomas Johnson in 1868. The cartridge is gripped by the side spring which is tightened by sliding the ring up the barrel of the tool. Each of these tools was individually numbered and this is number 1012.A hard to find item. Some wear but good overall condition. A 16B unamed pinfire redecapper. Good condition. A 12B roll turnover by P. Webley and stamped with their catalogue number 7007. Good condition. A rare nickel silver 12B hand roll turnover tool for a cased shotgun. Marked on the blued shut off plate with the makers name G & J.W. Hawksley of Sheffield. Good condition some rusting to the steel shut off plate. these nickel silver tools are solid nickel and not plated. They were the highest grade made by the 19th Century Sheffield Implement makers. A rare12B Combination tool incorporating a rammer/funnel powder filler, roll turnover, resizer and redecapper. Made by Lightwood & Son and marked with their partridge trademark. The handles have been chewed by rats but the steel parts retain a lot of case colour hardening. Good condition. A 12B roll turnover with a side mounted redecapper tool. Fair but dirty condition. It has lost most of the paint. No makers name can be found but probably made by Lightwood & Son of Birmingham. A large English powder measure for a fixed charge of 120 grains. Very good condition and hard to find in this large size. Powder measures in grains are usually associated with reloading rifle cartridges. A very rare12B redecapping tool. No markings. Can anyone identify this tool? I have never seen one of these before. The decapping pillar has a spring loaded decapping pin operated by the lever at the base of the tube. The tool is made from nickel plated brass. From the style and construction I believe it is a British manufactured tool but it is unneccessarily complicated to perform a relatively simple operation. There are two screws on the upright part that could be where some other part fits? An empty Eley cartridge box for 100 12B primed cases. Various award dates shown on the top upto 1908 and printed on the side with the cartridge retailer Linsley Bros Leeds who were gunmakers in Leeds Yorkshire . Printed with Nobel on one side. Good condition. Both need a good clean. A smaller than usual size measure graduated from 1 3/4 to 2 3/4 drams. Good condition. A 16B ebony rammer. Good condition. A 16B boxwood and brass Barclay Patent sprung filling tube and rammer. Unmarked. Good condition. A 12B cartridge trimmer by James Dixon & Sons Sheffield and stamped with their catalogue number 1114. Good condition. A little pitting on the steel lever and one corner of the blade is chipped. A high quality composed pair of powder and shot measures by James Dixon & Sons with nickel silver ends and ebony handles. The powder measure is stamped Powder No.2 (refering to Curtis & Harvey No.2 powder) and is adjustable 2, 2 1/8 and 2 1/4 drams. The shot measure is stamped Shot No.6 and is adjustable 1 and 1 1/16 ounces. Good condition. The side locking screws are missing. A 12B good quality redecapper by G. & J.W. Hawksley of Sheffield complete with the ebony base which is shaped for capping on one side and decapping on the other side. The scew cap is missing from the capper. The handle uscrews to reveal a couple of extra decapping pins which are included with the tool. Very good condition. A rare 12B Barclays Patent redecapper tool by James Dixon & Sons Sheffield with loading tube and rammer. Dixon catalogue number 5448 and illustrated on page 10 of their 1883 catalogue. The loading tube has internal springs to grip the rammer. Good condition. The knob on the end of the rammer should come off to reveal a decapping needle but I can't get it off. The wooden base cup is missing. This is a very hard to find tool. A 12B redecapper designated in the catalogues as "for camp use". Good condition. A 12B ebony rammer and brass loading tube for a cased shotgun. Good condition. A very rare redecapper tool by James Dixon & Sons stamped with their catalogue number 1186. The tool is incomplete - it is missing the coil spring and outer sleeve over the decapper inside the pillar but in view of it's rarity it is worth careful restoration. Good condition. A very unusual12B roll turnover tool with a round brass clip on the lever with two spikes to prevent the cartridge from turning during loading. No name but from the style I think this made by Hattersley of Sheffield. Very good condition. A rare 12B pinfire redecapper and cartridge trimming tool with boxwood handle. At the end of the handle is a knurled wheel on a grub screw which is used to grip the old pin to remove from the cartridge. The tool is missing a small screw in cup at the other end which holds the new primer cap for insertion into the new cartrdge case. The tool also incorporates a cartridge trimmer blade which emerges when the knurled ring on the body of the tool is turned. There is a dent to the brass tube which you can see in the photos. In need of some restoration but a very rare tool. An unusual powder measure with nickel silver measure and boxwood handle. I have seen this combination of nickel silver and boxwood in measures cased with Purdey pinfire shotguns. The measure is adjustable in two positions only and locked by a screw. Very good condition. An unusual roll turnover tool by James Dixon & Sons with a grooved side claw rather than the more commonly encountered double claw. Marked with their catalogue number 5119. Very good condition with lots of the original paint and some case colours remaining. A rare and completely original Eley Brothers catalogue for 1912 - 1913. Measures 11" x 8 3/4" with 96 pages. Good condition . A rare original Eley Brothers catalogue for 1904 with the original half leather binding. Measures 8 3/4" x 6" with 79 pages. Generally good condition, leather surface rubbed and a little tatty. A 12B pinfire vertical loader by Bartram & Co. of Sheffield and marked with their trademark "Nimrod". Good condition. A 12B pinfire redecapper by James Dixon & Sons. Very good condition. A 10B Horsley Patent redecapper. No maker marks. Good condition. A rare 28B redecapper. Good condition. A superb 12B boxwood rammer and filler. Beautiful colour and superb condition. very rare in this condition. A 28B Horsley pattern redecapper. Good condition. A .410 redecapper. Good condition. A rare 28B roll turnover by Lightwood & Son Birmingham and stamped with their trademark of a partridge and L&S. Excellent condition and hard to find in this calibre. A 12B hand held roll turnover tool by James Purdey & Sons. Good condition. Some scratches to the ebony handle and flaking to the plating but Purdey tools are hard to find. A rare wooden display cartridge board for Nobels Sporting Ammunition. This would have had a fabric covered shield shaped placque with cartridges fastened onto it but this and the glass is missing. Measures approximately 28 1/2" x 19". Good condition. Worth restoring as these cartridge boards when complete are selling for several thousand pounds. A 12B pinfire roll turnover tool by G & J.W. Hawksley. This is one of their best quality tools with wing nu detachable lever and buffalo horn handles. Very good condition. A 12B redecapper with twin pillars in a cage. Good condition. A rare .410 roll turnover tool built on the small frame. Not named but the style is the same as Hawksley manufactured tools. Good condition. A .500 rifle tool to push the bullet into the cartridge case. A good accessory for a cased double rifle. Good condition. A rare12B spring loaded recapper by James Dixon & Sons no.1178 on it's original ebony base. Good condition. The brass retains some of the original lacquer. The ebony base has an age crack. A rare 12B redecapper by James Dixon & Sons Sheffield marked with their catalogue number 1197. Excellent condition with lots of the original lacquer. A 12B pinfire roll turnover by G. & J.W. Hawksley Sheffield. Excellent condition with most of the original paint and case colours on the levers. A 12B Despatch redecapper tool by G. & J. W. Hawksley Sheffield. Superb condition with virtually all the original gilt lacquer. The underside of the base retains all the original paint and the screw in the pivoting arm has all it's original blue. One of the best examples I have seen. A very rare 12B pinfire roll turnover combination tool by W. Bartram & Co Sheffield. There is a spring loaded rammer and funnel for filling and ramming the cartridge plus a vertical roll turnover. A large tool. Very good condition. There is a screw missing from the bottom and the brass shut off plate has a brazed repair both of which you can see in the last photo. An unusual universal measure with scales for shot black powder Schultze and E.C. Powder. The measure adjusts by sliding out with a locking screw on the side. Good condition. A 12B James Dixon & Sons redecapper 2181C. Very good condition. A 12B redecapper by W. Bartram and marked with their NIMROD trademark. Good condition. A rare James Dixon & Sons climax loading machine patented in 1887 for loading 100 cartridges with powder. All these machines are individually numbered and this one is 781. Good condition and in working order but does need a little restoration and cleaning. The glass window is missing from the bottom of the front of the tin plate hopper but could easily be replaced as it slides into the channels in the hopper. A screw is loose at the rear in the wood. The machine comes complete with a 12B loading tray and a 12B wad board both marked James Dixon. This is very heavy and is only available for collection and would be too expensive to post overseas. A telescopic sliding powder and shot measure by G & J.W. Hawksley which measures up to 2 ounces shot and 5 drams of powder. The locking screw is missing. Excellent condition. A .410 roll turnover tool. Dirty but complete condition. A 14B redecapper. 14 bore tools are getting increasingly harder to find. Good condition. A very rare 12B roll turnover tool which was designed to be screwed to the edge of a bench or table rather than the more usual clamp. I have never seen one of these before. Good condition. A 20B redecapper by G. & J. W. Hawksley and partially stamped on one side of the lever with their despatch trademark. Very good condition. A 16B redecapper by Webley and marked with their catalogue number. Excellent condition. A 20 bore redecapper on the Horsley Patent. No makers name but in excellent condition retaining lots of the original lacquer and paint. A 12B pinfire roll turnover tool by James Dixon & Sons catalogue no. 1117. Good condition. .
A 12B pinfire redecapper by G & J.W. Hawksley Sheffield. Sleepy rusty and uncleaned condition. A 12B redecapper tool by G & J.W. Hawksley Sheffield with lacquered brass barrel and ebony handle which screws off revealing a cavity inside which is a spare decapping needle. Excellent condition.